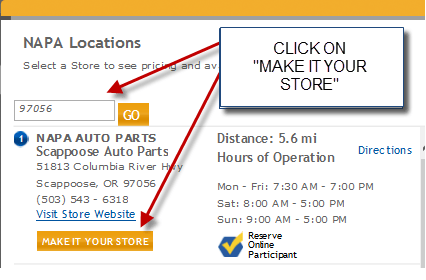 If you have an account with Sunset Auto Parts you can get set up a NAPA ProLink Account and purchase online through the NAPA ProLink portal. To set the NAPA ProLink Account up click https://napaprolink.com/newuser.aspx. 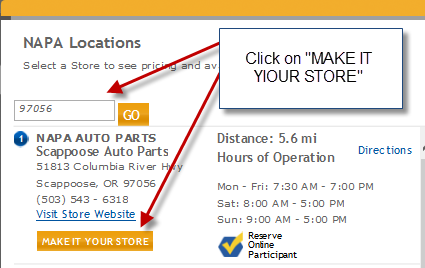 If you do not have a NAPA ProLink Account setup, you can purchase online using http://www.napaonline.com. If you are taking advantage of the monthly NAPA Specials from our website, a few preliminary steps are required first. IMPORTANT NOTE: We will under no circumstances release items that were purchased online with a credit card, without verifying proper identification and credentials. When ordering through http://www.napaonline.com you will need to identify which NAPA store you will be purchasing from. In the top right side of the webpage enter the zip code of that store, and on the next page, click on “MAKE IT MY STORE.” See below. If you’re one of our valued customers in a city other than Longview, you may not be aware that we have a new facility in this port city. It’s great being a part of this vibrant, historical community and we’re pleased that we now offer a shining new facility to best serve our customers. If you’re a regular customer at this store, you know how excited we are to be in this new building that is stuffed to the ceiling with parts. If you haven’t seen the facility and find that you’re passing through, come on in, say hello, and we’ll show you around. Follow NAPA Longview on Facebook. We’re pleased to have this space filled with parts now! our shelves our stuffed with supplies. We’ve got a state of the art parts reference counter. We’ve got plenty of Space and parts! Another shot of that advanced concrete we’re excited about. We have a peaceful little spot for employees to take lunch and get some sun. The concrete is an advanced porous material! Like NAPA Banks on Facebook! We’re proud to be your local NAPA Auto Parts Store right here on the Oregon Coast in beautiful Astoria! We have over 500,000 part numbers for your import or domestic car, truck or van. Stop in today and let us put our NAPA Know How to work for you. Like NAPA Astoria on Facebook!